Haste makes waste – this proverb holds true today also. However, if you think about it hard enough, you may find that haste also teaches us new things, or as it happened recently with me, reminds us of things we already know. I generally prefer the use of the keyboard to perform most of my tasks because I find that it works much faster for me. Therefore, to execute a query, I use the F5 key instead of pressing the “Execute” button. A couple of days ago, I was working on a query to diagnose a data issue and in my hurry to execute it, I pressed the F5 and the “5” key together (the number 5 is just below the F5 key if you observe). What happened here is actually, quite simple. As you can see, SQL Server took the number “5” as the value, and the rest of the string as the column alias. This is because the column alias is a database object name and all object names must follow the rules identified for identifiers. In our case, the column alias was accidentally altered to become “5JobTitle”. Because a column alias is an identifier and cannot start with a number, SQL Server automatically set the value to be “5” and the column name to be “JobTitle”. So, that was a reminder for me to slow down before I furiously start typing on the keyboard. 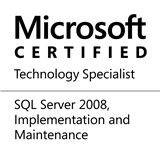 This entry was posted in #SQLServer, Blog, Imported from BeyondRelational and tagged #SQLServer on April 23, 2012 by nakulvachhrajani.